TAMPA -- Sandra Friend talks about the psychological benefits of hiking before the physical ones. "Hiking just lifts the stress right off of you when you walk at a comfortable pace and take the time to stop and smell the azaleas like I did today," says Friend, the author of eight books on hiking in Florida. "I was at some state parks near the Suwannee River this morning. The scenery was beautiful. The trails went right by the river. You can't beat that for exercise." Friend, the communications director for the Florida Trail Association, based in Gainesville, has hiked 2,500 miles of Florida trails and says it makes her mentally and physically healthier. Hiking is good for your heart, lungs, legs, ankles, feet and blood pressure, as well as your peace of mind, she says. "Getting that cardio exercise, even at a moderate pace, is an easy thing to do when you are taking a walk. And where is it more beautiful than out on a trail? 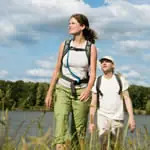 The American Heart Association recommends 30 minutes of hiking, brisk walking, stair-climbing or other aerobic exercise "most days of the week." For beginners in flat Florida, Friend recommends hiking a mile at three miles an hour, which should take about a half-hour. Regular hikers might shoot for five to 10 miles a day for a decent workout. "I don't feel a real burn until I've done more than six miles, but then I'm not trying to tromp along at a 4-mph pace like a runner. I like to enjoy the scenery as I go," she says. Before you even think about hitting the trail, Friend says to buy a good pair of running or walking shoes or hiking boots. Each person's feet are different, so ask a knowledgeable person in a sporting goods store to measure your feet before you buy. Walk around a little to be sure the fit is right. Friend prefers New Balance running shoes, which tend to be wider than other name brands. She also always wears socks made with polyester and wool. She says they breathe better than pure cotton. She wears low-cut socks because she tends to get heat rash and says the low-cut ones don't scratch as much. She always wears sunscreen and a hat -- one with a brim that covers her face. Another must: Be sure to take along plenty of water or a sports drink such as Gatorade, even in cooler weather. Friend recommends a liter for every three miles in cool weather and twice that at 75 degrees or warmer. For snacks, she likes cereal bars or health bars, a piece of fruit and nuts. "Things with salt are a good idea. In any kind of exercise, you sweat and deplete salt. Nuts are good, healthier than carrying potato chips, and they don't crumble as quickly." Before starting your hike, Friend says to stretch your legs, back, shoulders and arms. She likes to lean forward with her hands on her car or against a tree to stretch. She also does leg lunges. And don't forget to clear your mind of the troubles back in the office or at home. "On a hike, you are far removed from being in the office or being at home with the television or computer on," she says. "When you are out in the woods, you are not being distracted by technology. You are being tuned into nature. So much of our culture has been driven away from direct contact with the land. Hiking is almost like an escape into the past of humankind." To learn more about Sandra Friend, her Florida trail books and hikes she recommends, go to her Web site at www.floridahikes.com. The Florida Trail Association's Web site is also helpful. Check it out at www.floridatrail.org. Reporter Karen Haymon Long can be reached at (813) 259-7618 or klong@tampatrib.com. Copyright (c) 2007, Tampa Tribune, Fla. Distributed by McClatchy-Tribune Business News.